Siga ni Sucu (pronounced Singa-ne-Suthu)! Muriel, Carl, and friends will be having Christmas dinner down at the Salty Fox this year. Have you made your reservations? The three-course meal and complimentary champagne are $50 (FJD) per person. The festivities begin at 2pm. Our version of a christmas tree — Salty Fox style. It's been a very exciting year, we started and finished construction — and then opened a beautiful new resort. We've also learned about online travel distribution, hired new staff, furnished a new resort, trained the new staff, and don't get me started about all of the copy Fred's had to right for brochures, banners, advertisements and the like. Hopefully in 2015 he'll be able to finish the Taveuni Adventure Guide he's been talking about. We'll be sending out emails to our fans and wholesale partners in the next day or so talking about recent happenings, and some of the tools we've been working on. You may want to check the tools out at this link. (psst... email Fred if you still need the password). 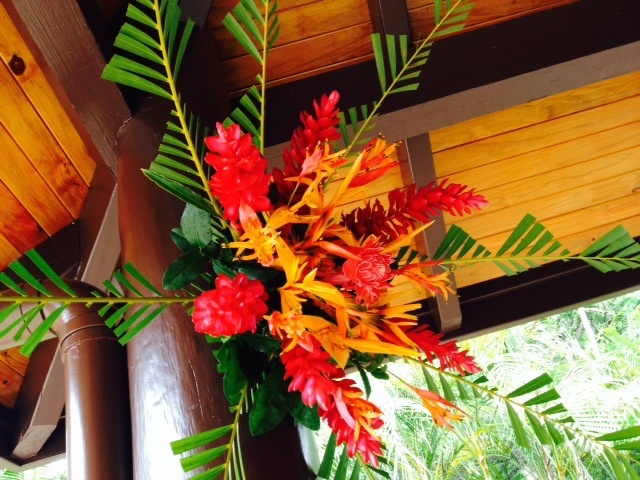 Also, Dilip from Meridian Store posted some cool pictures of the resort on the Taveuni Fiji Facebook page. I've posted some of the pictures we liked here, but you should check out his post. We've also thrown some of the photos into our slideshow. Newer PostNew Years Eve - 2014!